According to commenter TJ below who satisfied the spending requirements in the first billing cycle, s/he got the certificates two weeks after the close of the 1st statement. My guess is that they just want to make sure you pay the annual fee. Also, good tip to check your spam folder for the e-mailed certificates! 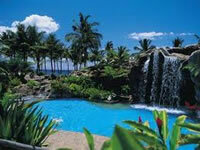 I called in to book the nights I wanted at my resort of choice – the Grand Wailea (Waldorf Astoria) in Maui. (I’ve never stayed there before, but it looks pretty awesome.) Keep in mind that although there are no category restrictions (it doesn’t matter how expensive the hotel is on average), you can only book a “standard room” which I believe is their cheapest tier of rooms. So if you want a busy weekend that is coming up soon and those cheaper rooms are sold out, you may not get it. However, I was able to get two consecutive weekend nights. I am also able to cancel without any penalty or fees up until 14 days before the booking. If I was to have used points, it would have taken 70,000 per night for a total of 140,000 Hilton Honor points. Note that I took out the resort fees, which are reportedly not waived when booking with certificate or points redemptions (any taxes on the room rate are covered). Resort fees are $25 per night ($28.35 with taxes). You actually get the following stuff too: “Guest internet access; beach umbrellas for use on Wailea Beach; admission to twice daily SCUBA clinics; free bike rental”. In the end, this is a great way for casual travelers to stay two nights at a really fancy hotel where you can’t imagine paying over $300 a night. We applied and got ourselves two nights at the Grand Wailea in Maui. However, you should keep in mind that the reward certificates are only for Fri/Sat/Sun nights and are based on room availability so some flexibility in either hotel choice or dates is recommended. 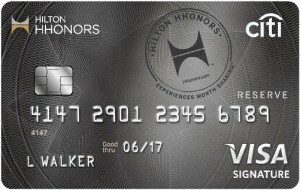 On an ongoing basis, the card is ideal for Hilton hotel regulars – You get 10x points on Hilton purchases and free Gold elite status (perks include late checkout, free Wi-Fi, and a free breakfast at many hotels). If you spend $10,000 in a year, you get another free weekend night certificate, which you can weigh against the $95 annual fee. Updated 2015. American Express has a banking division called Personal Savings through their FDIC-Insured bank American Express Bank, FSB. There are currently just two products – a high yield savings account and certificates of deposit. This is a review from my own experiences with the American Express Personal Savings Account. You don’t need to have an American Express credit or charge card to open a bank account with them. The savings account has no minimum balance requirement, no inactivity fees, and no monthly fees. 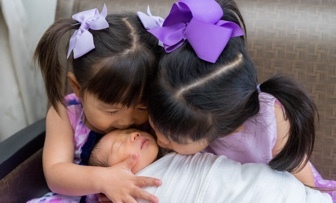 Their current interest rate is 0.90% APY (as of 4/13/15). As with all savings accounts, the rate is subject to change. Their rate history for the last few years has been that they consistently pay a competitive interest rate but usually not the very highest. They are usually in the mix with their competitors like Capital One Consumer Bank (0.75% APY) and Ally Savings (0.99% APY as of 4/13/15). Like those other online savings banks, this one is designed to piggyback onto your existing checking account through online transfers. There are no checks, no ATM cards, and no online bill-pay with this account. If you really want, you can withdraw your money by having them send a check payable to you. Interest is compounded daily, and credited monthly. Interest begins to accrue on the business day the deposit is received, as long as it is by 5pm Eastern. The application process can be done completely online. You provide the usual personal information, as well as the routing number and account number of the checking account you wish to link and fund your account with. There is no minimum opening amount. AMEX Bank will then send two small verification deposits of under $1 to your checking account (and then withdraw them as). They’ll also send a verification code to your e-mail address. With this information, you can activate your account and initiate the funding transfer. They’ll send you a welcome packet in the mail, but there is no paper to sign or send in. 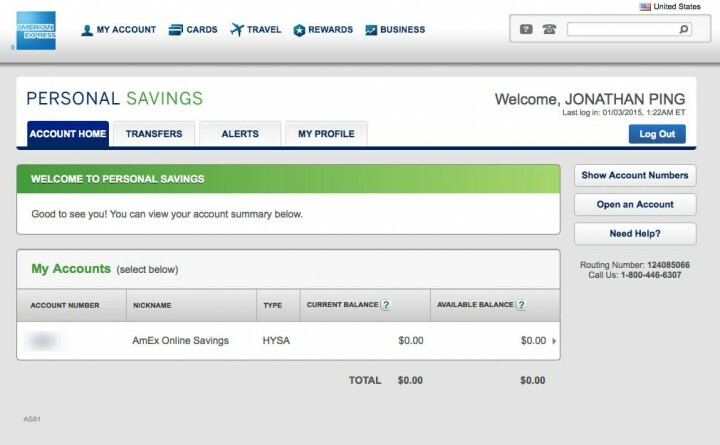 In the beginning, AmEx used a 3rd-party backend service but now the entire bank website is hosted at personalsavings.americanexpress.com. Here are some screenshots of my bank account after logging in with some captions (click to enlarge). 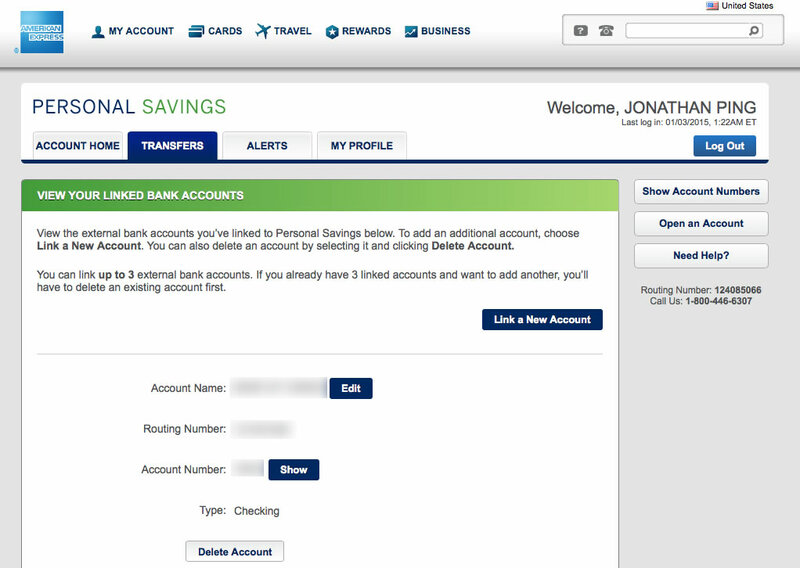 You can link up to 3 external bank accounts, and you can remove and add accounts online as needed. Online transfers to/from your external accounts take the usual couple of business days to complete. However, I wasn’t thrilled about this note on the transfer page: “Funds from electronic deposits to your account that you have initiated through us will generally be available for withdrawal on the sixth business day after the deposit is initiated.” This is likely for protection against fraud, but could be inconvenient and discourages me from using this account as a central transfer hub. Customer service is available by phone only – no secure online message or live chat. Call 1-800-446-6307, available 24/7. Although you have to navigate the usual phone tree, once you do reach a human they are as courteous as the reps from AmEx credit cards, which is to say very courteous. 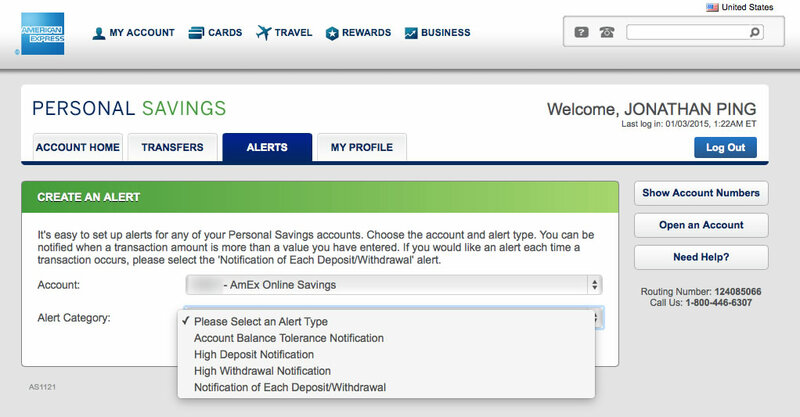 You can set up free, automated e-mail alerts in case of your balance reaching a certain threshold or the arrival new deposits and/or withdrawals. Text messages are not directly supported but you can usually find an e-mail version of your cell number (ex. [email protected]). Finally, one unique thing about American Express Personal Savings is that they give you free paper, snail-mail, monthly statements. Many online savings accounts only include you electronic statements and will charge you for paper statements. Of course, you can opt out and just stick to e-statements, but I can see paper statements as being attractive for some folks. A commenter below noted that if you elect paper statements, then AmEx limits the amount of transactions you can view online to the last 30 days. Customer Service: 1-800-446-6307, available 24 hours a day. I haven’t had to call in yet, but American Express does have good customer service on their credit cards in my experience.